PANDORA WAS WALKING DOWN THE HALL TO her favorite class—Science-ology—when she spotted something so interesting that it made her pale blue eyes go wide. Black-haired with gray-green eyes, the Titan godboy and his brother Prometheus had only been attending Mount Olympus Academy for a couple of weeks. “Don’t you see that box he’s holding?” Pandora couldn’t take her eyes off it. It glowed and twitched in Epimetheus’s hands. And interesting sounds were coming from it. Like mouse squeaks, salpinx trumpets, and tiger growls all mixed together. “What do you think is in it?” she asked as they paused at the hall fountain. Epimetheus had stopped at his locker nearby. Pandora kept an eye on him and his box as she and Athena took turns sipping the glittering nectar that arced from the fountain’s spout. When the immortal godboys and goddessgirls at Mount Olympus Academy drank nectar, it caused their skin to shimmer. It had no effect on Pandora’s skin, though. Because she was mortal. One of the few mortals Principal Zeus had invited to go to school here at MOA. Athena was eyeing the box now too as she straightened from the fountain. “Well, maybe it’s—” she started to say. “A bracelet or a genie wouldn’t make those weird noises, though,” said Athena. Holding her long wavy brown hair back with one hand, she took another quick sip of nectar from the fountain. Afterward her golden skin shimmered a little more brightly. Because, unlike Pandora, Athena was a goddessgirl. She was also the brainiest student at school. She and Pandora were roommates, sharing a room in the girls’ dorm upstairs on MOA’s fourth floor. “C’mon. Let’s get to class,” Athena said. Pandora grinned. She had a reputation for being more curious than practically anyone else at the Academy. In fact, as a sign of her curious nature, her blue and gold bangs were shaped in the form of question marks. But what was wrong with being curious? Nothing, in her opinion! Without waiting for Athena’s reply, Pandora took a step in Epimetheus’s direction. But before she could take another step, someone behind her called out in a mean voice. “Hey! Dork-i-metheus!” It was Kydoimos. He and his godboy pal Makhai pushed past Pandora and Athena. Kydoimos was laughing so hard at his own joke that he didn’t seem to notice when his shoulder bumped Athena. One of the three textscrolls she was holding went flying. It hit the floor by Pandora’s sandaled feet. She stooped to pick it up and then handed it back to Athena. “Aren’t you even going to say ‘Excuse me’?” she called after the boys. But they didn’t hear. They were too busy making a beeline for Epimetheus. When it came to Titans, the godboys at MOA were always itching to start trouble. In some ways that was understandable. The Titans had fought a war against the most powerful and important god at the Academy—Principal Zeus. They’d tried to keep him from becoming King of the Gods and Ruler of the Heavens. Zeus had defeated them, of course. And the war was long past now. Still, a lot of distrust remained. Everyone knew that Epimetheus and Prometheus were the sons of Iapetus, a Titan god who had battled Zeus. So most of the students, Pandora included, couldn’t help wondering why Zeus had invited the sons of his enemy to go to school here. But he must have had his reasons. So shouldn’t they give these Titans a chance? What if the situation were reversed? she wondered. If one of MOA’s godboys got sent to a Titan school, wouldn’t they want to be treated with kindness? “Whatcha got in the box, Dork-i-metheus?” Kydoimos asked Epimetheus before Pandora could ask him herself. Except she wouldn’t have called him a dork, of course. Kydoimos really acted like a bully sometimes. Same went for Makhai. Epimetheus didn’t answer. He only clutched his mysterious box tighter and shut his locker. Then he headed off for class. Excited curiosity bubbled in Pandora. Since Epimetheus was in Science-ology next too, he was going the same way she and Athena were. Maybe she could get a better look at the box in class. As Pandora and Athena fell into step behind Epimetheus, Makhai sneaked up next to him. In a flash Makhai snatched the box away. “No!” Looking freaked out, Epimetheus made a wild grab for it. “Over here!” yelled Kydoimos, laughing. Running backward down the hall, he went long. His arms were raised like he was going out for a pass. Other students leaped aside in a hurry to get out of his way. Makhai tossed the box toward him. Everyone watched it sail overhead in a high arc, nearly brushing the domed ceiling. The inside of the dome was covered with paintings that illustrated the glorious exploits of the gods and goddesses, including their long-ago battle with the Titans. Pandora glimpsed Poseidon, the tall, blond godboy of the sea. His turquoise eyes had narrowed fiercely when they’d landed on the battle paintings. Then they darted to the mystery box. It had overshot and was hurtling past Kydoimos. Pandora gasped, afraid the box would smash on the marble-tiled floor. But Poseidon saved the day, leaping to catch it in one hand. What a hero! thought Pandora, sighing with admiration. Like numerous other girls at MOA, she’d been crushing on the mega-cute Poseidon for years. Dangerous? Pandora’s eyes rounded in dismay. Hadn’t she expressed that concern to Athena just minutes ago? Only, Pandora hadn’t really expected to be right! Looking startled, Poseidon shot a worried glance at the box, then quickly tossed it away. It fell into the hands of another godboy named Apollo. He looked startled too, and tossed it to Ares, the godboy of war. After that it was tossed from hand to hand as if it were a hot potato. Since nothing bad happened as a result, the tossing soon turned into a boisterous game of Keep Away. “Epimetheus looks upset,” Athena murmured. “I know. I feel kind of sorry for him, don’t you?” said Pandora. Athena nodded. “If everyone stops watching, maybe the boys will quit teasing him. C’mon.” She tugged Pandora’s arm, hinting that they should leave. But Pandora had her eyes glued to that box. She just had to know what was in it! The box gleamed in the rays of sunlight drifting in through the windows, looking like a rectangular golden sun. However, when Athena kept tugging at her arm, Pandora reluctantly went. Still, she kept watching the game over her shoulder. Every time the box fell into a new set of hands, Epimetheus veered in a new direction. He skidded back and forth across the hall, desperately trying to retrieve the box. Suddenly one of the boys’ throws went wild. 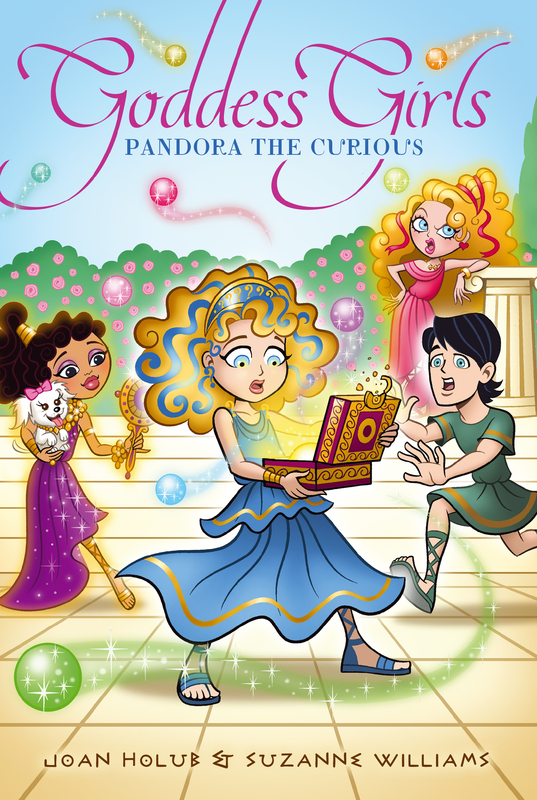 Pandora lost sight of Epimetheus’s box as the entire group of boys made a rambunctious leap all at once. Hands reached. There were shouts and whoops of laughter. The box tumbled and was knocked about in the mass attempt to grab it. Amid the frenzy Pandora and Athena got separated in the crowded hallway. Pandora was pushed into a corner at the end of a row of lockers. Going up on tiptoe, she was looking for Athena, when, unexpectedly, the mysterious box dropped . . .